When you think of Jared, the "Subway Guy," what do you think? I picture a lean, decently-nerdy guy holding up an oversized pair of nineties jeans. Jared symbolizes weight loss. The miraculous "Subway diet." The only time I've ever stepped foot into subway was to follow a friend who wanted to buy a fountain soda. To be honest, I wouldn't ever eat there because I'm finicky. But despite skepticism from Subway's marketing team (and picky folks like myself), the Jared ad campaign worked! Lucky for Jared, he will now always represent losing a lot of weight by eating consistently at a fast-food chain. What a life! Jared is one of my heros. I want to be the Jared to your disorganization. 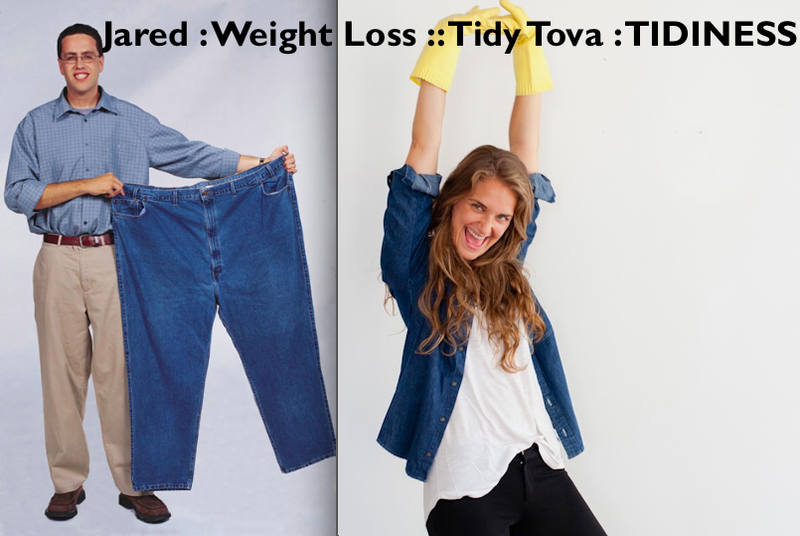 Just when you think you can't get a handle on your things, take a look at that poster-sized picture of Tidy Tova that you hung over your bed. Or send me an email and I'll send over encouragement and advice. If you're feeling extra dangerous, you can have me come over to lend a helping hand and brain (fee$ may apply).